The Milky Way in the age of Gaia program will take place in building 209F of the Institut d’Astrophysique Spatiale (IAS) on the University Paris-Sud campus in Orsay. The 209F is equiped with 7 triple offices, a meeting room for up to 50 people and a large common/coffee room for informal discussions. This is where most of the activities will take place. Each participant will be provided with a desk for the duration of his/her stay. The IAS 209F building has 21 desks available for non-local visitors. Unlike similar programs held at other institutes we will not use a wiki for exchanging information. The collaborative information exchange will be done primarly using a dedicated SLACK team: ism3d.slack.com. 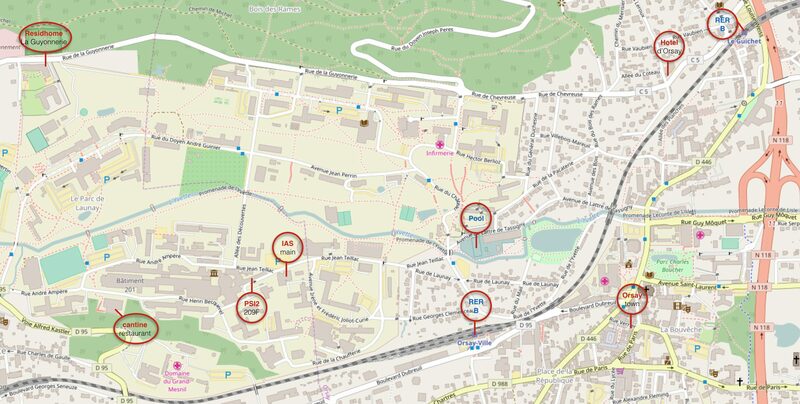 In general for lunch we will go to the local restaurant of the university (the "cantine", 5 min walk). It is a self-serve restaurant with a limited choice of meals every day but the menu changes daily. There is also the possibility to go to the town of Orsay (12 min walks) where you will find a few restaurants, a grocery store and 2-3 bakeries where you can buy sandwiches, quiches and salads to go.